I don’t spend every waking moment blogging. While I love blogging, my life is full of non-blog activities. I am a wife, mom, friend and campus minister. I also have some new business ventures, not to mention a ridiculously long list of hobbies and pastimes. That reality results in one or two blog posts per week, which is too few and far between, according to most blog analysts. Some people can afford to blog full-time, and develop hundreds of connections with readers and fellow bloggers. If I’m lucky, I spend a few hours a week on blog-related activities. I am not a savvy blog networker. Before my son was born, I spent more time reading and commenting on other blogs. In my current life stage however, I find it challenging enough to maintain real life relationships. Even though I read a considerable amount of blogs, I very rarely comment on them, join in blogger meet-ups, or attend blog conferences. I have met some very intriguing people though blogging, but don’t really have the time or social energy to invest a lot into those relationships. My blog is sometimes witty and insightful, but mostly genuine and heartfelt. People (myself included) generally gravitate toward blogs that are funny, snarky, clever, or controversial, like FAIL Blog or Perez Hilton. Aside from the rare interesting moment in my life (anyone remember the interracial marriage blog confrontation? ), I mostly write about real life things. Such as my son, food I love, and life lessons being learned by this 29-year-old lass. Some people (I hope) find my offerings worth reading, but many will probably move on after a quick glance and the realization that I lead a relatively simple, unglamorous life. I started this blog about 3 1/2 years ago. Its genesis came from a moment of spontaneity, and the thought, “I think I want to try this blogging thing.” For a while, I was intrigued with the notion of becoming a notorious blogger surrounded by lots of hype and fans. But I soon came to the conclusion that simply isn’t who I am as a blogger. I blog as an outlet of creative expression. I blog because I enjoy inviting others into my life. I blog to share simple joys with anyone who might come across my little nook of the internet. 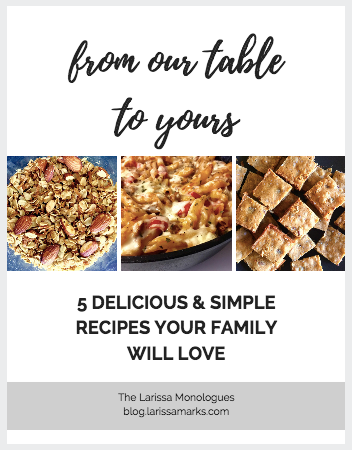 A warm, wholehearted thanks to all of you who read The Larissa Monologues, despite its humble status. Thanks for allowing me to be myself, and joining me in the journey. I promise to stay true to my authentic self and voice on this blog.